Solid oak frame, Completely reupholstered with new springs, padding, webbing, and a distressed leather look. 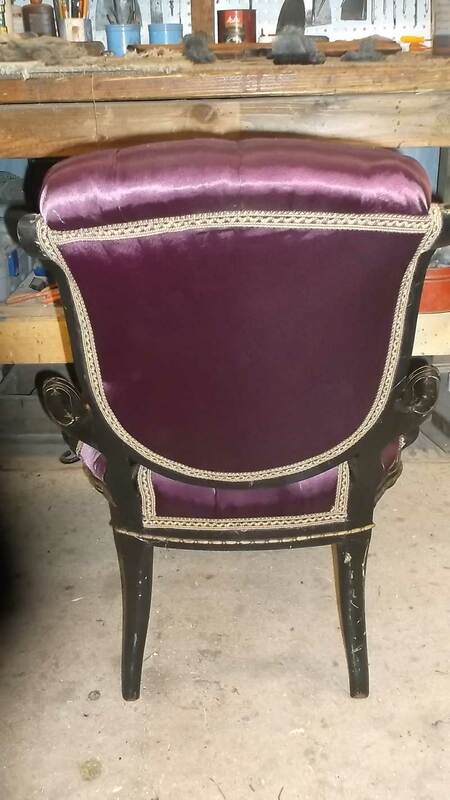 Frame has been completely refinished prior to upholstery. Very comfortable and functional! Start your very own psycho analytical practice!! A beautiful addition to any home! 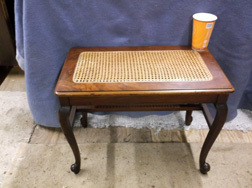 Cute little footstool, as shown. WAS $550.00/Set . . . Completely rebuilt with new springs, padding, and upholstery. Very comfortable and striking looking. Solid oak with a dark fumed finish. WAS $1,200.00 as shown . . .
WAS $285.00 . . .
WAS $225.00 . . . 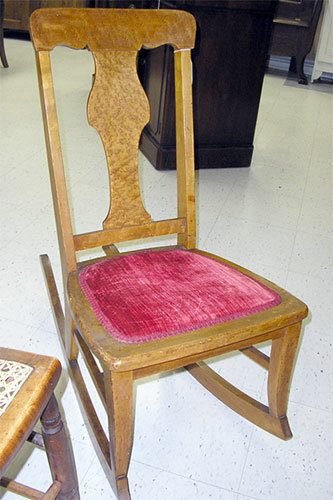 Solid Walnut, 4 sides and 2 arm chairs, circa 1870-1880, shown as found. 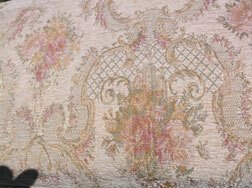 Buy as shown or re-upholstered with your fabric. 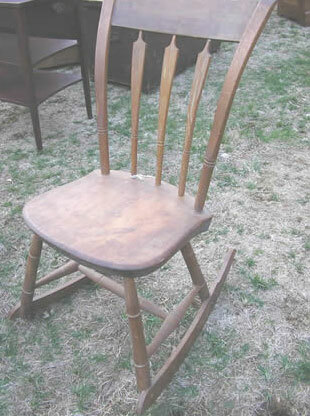 Nice early arrowback, plank bottom windsor chairs. 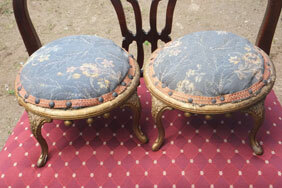 Early 19th century vintage, great patina and condition, solid with no repairs noted. 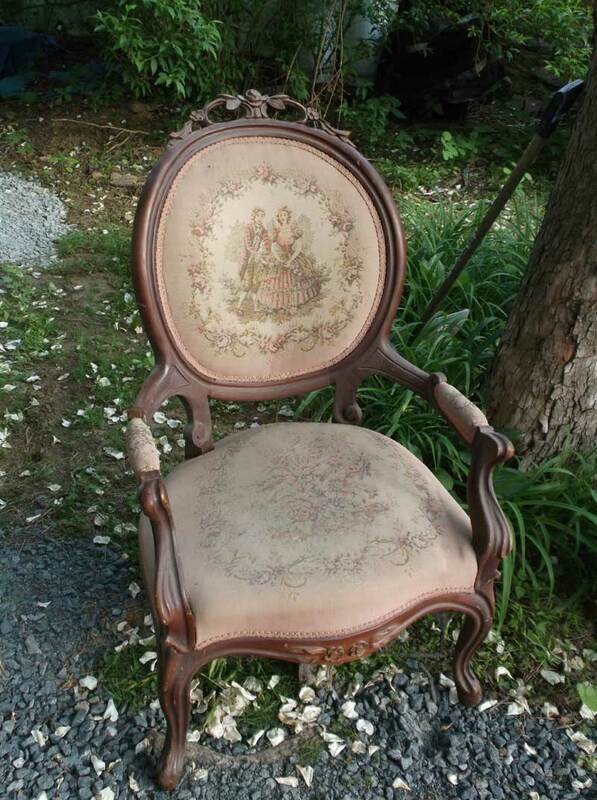 Very sweet small French side chair for vanity or desk. Curved legs with caved knees, feet and back. A lovely little chair! 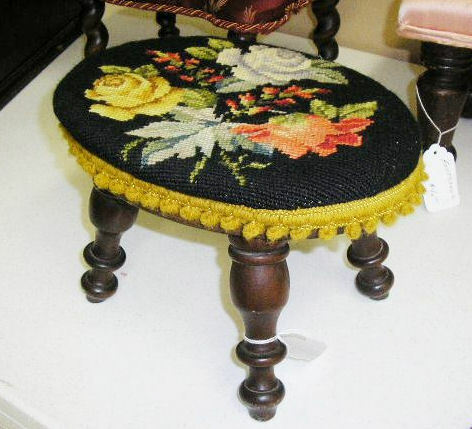 Very pretty needlepoint armchair. 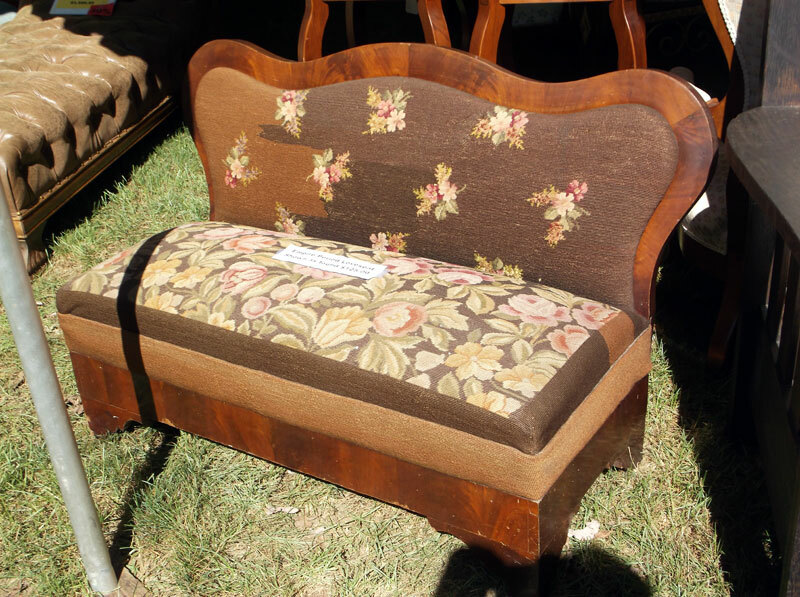 Solid mahogany with padded arms, newly re-padded with original fabric and new springs, padding, webbing, etc. 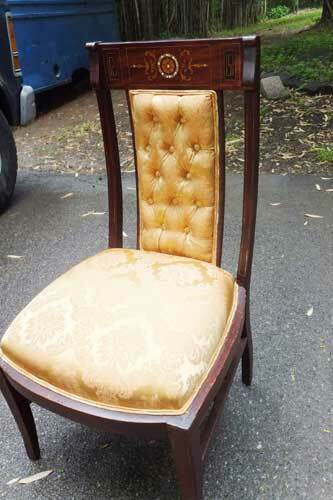 Very formal balloon back arm chair, solid walnut with salmon velour upholstery in excellent condition. 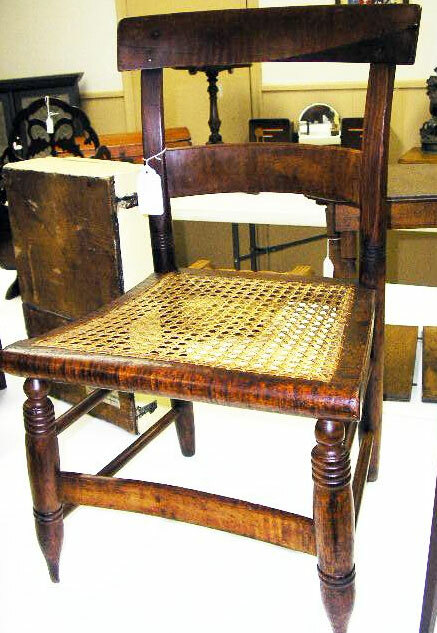 A great looking chair, ready to go! Very formal balloon back arm chair, solid walnut with fruit & nut carving on back, upholstery in excellent condition. 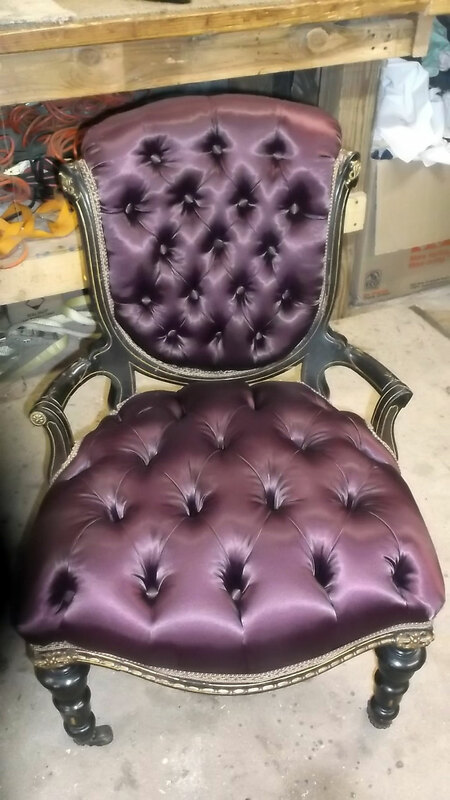 A great looking chair, ready to go! WAS $395.00 as shown . 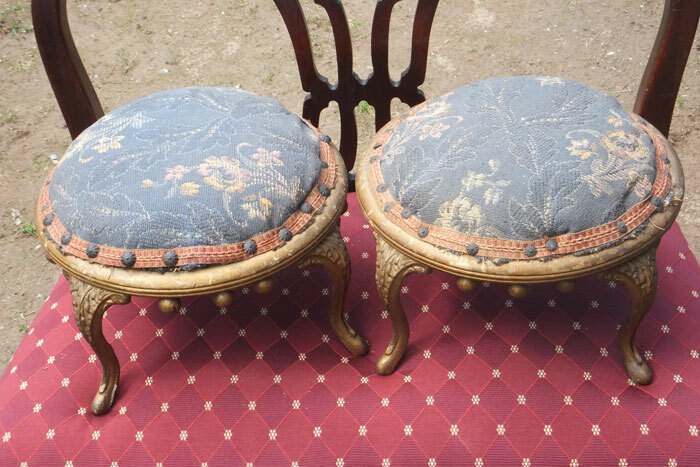 . .
WAS $175.00/pair as shown . . . 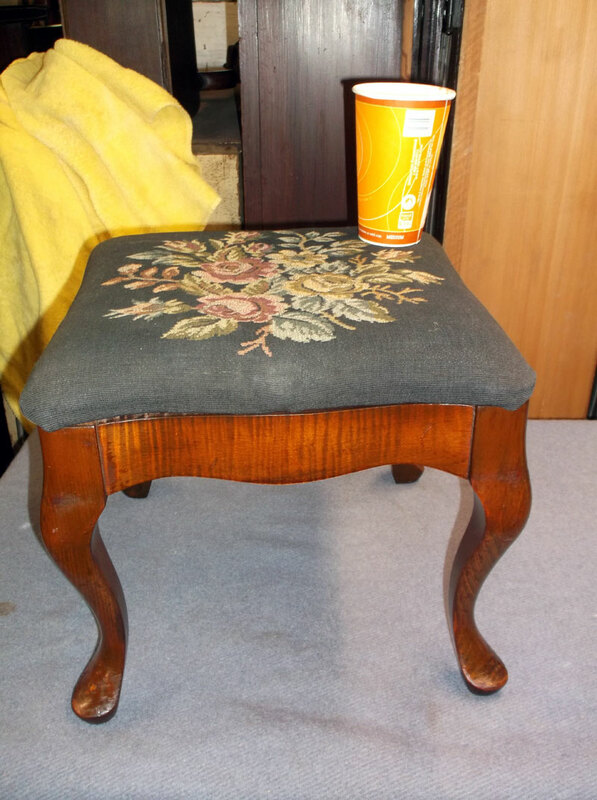 Figured cherry base with Queen Ann legs & feet, charcoal fabric with flowered needlepoint Coffee cup shown for size perspective. 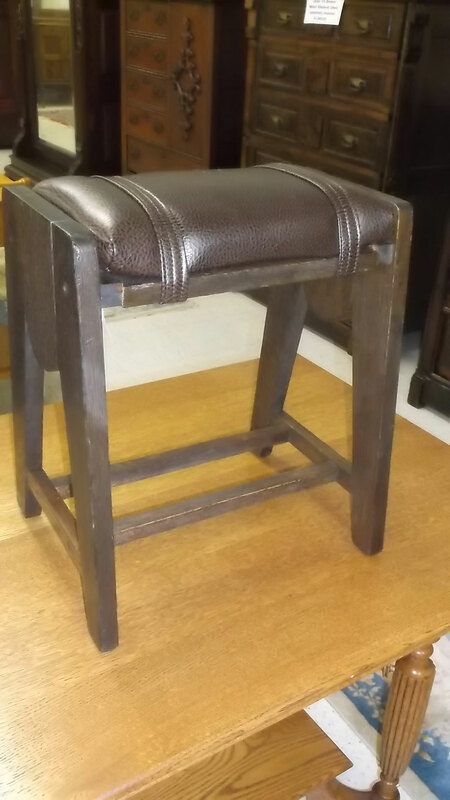 Solid Oak mission oak styled footstool with green leather cushion. Cushion recently repadded. Not old, but very solid and strong. Golden Oak color. Just completed total restoration. Ebonized frames with brass ormalu. 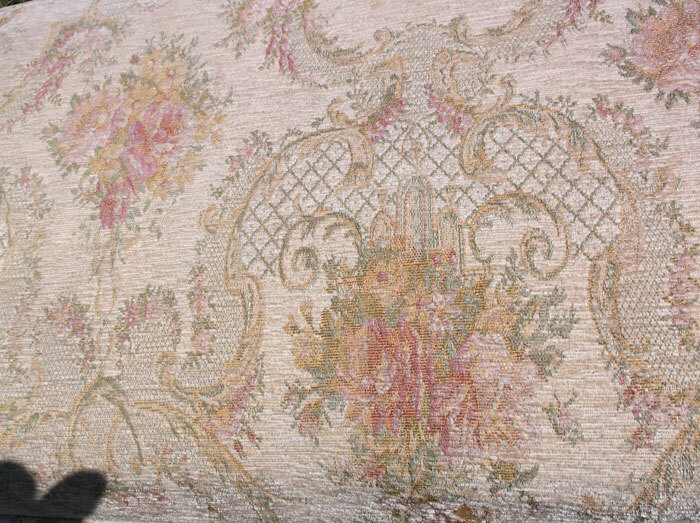 Pottier & Stymus was a high end NYC furniture manufacturer in mid 1800’s, building furniture for the “well to do”. 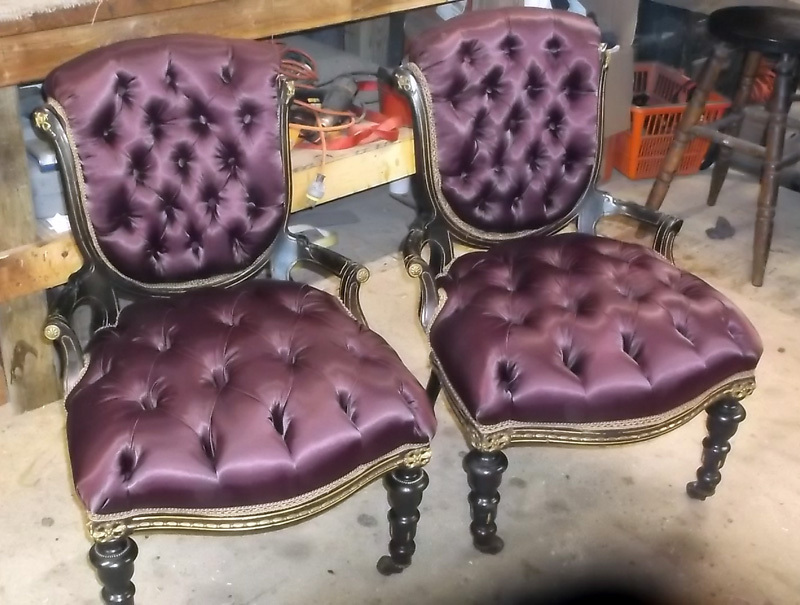 The photos truly do not convey the true beauty of these chairs. They must be seen in person to be truly appreciated! Solid Oak, good color, center stretcher, perfect for your country kitchen and harvest table! 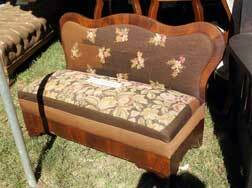 Needlepoint seat and back, crotch mahogany veneers, solid! Solid Oak, Southwestern motif. Not old, but solid oak and in very good condition. Side chair, arm chair and settee. 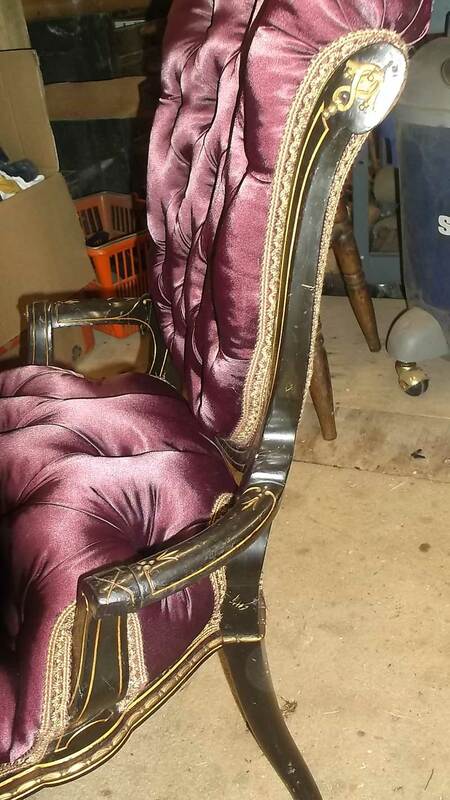 Solid walnut frame, good gold velour fabric, no rips or heavy wear spots, can be used as shown or we can re-upholster with your supplied fabric. Solid Oak, Lions Paw Feet, Fluted Column Sides. Solid and very comfortable. OK! Put your thinking cap on! 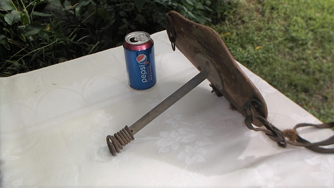 Shaped somewhat like a bicycle seat, short rod with a spring underneath, and leather straps. 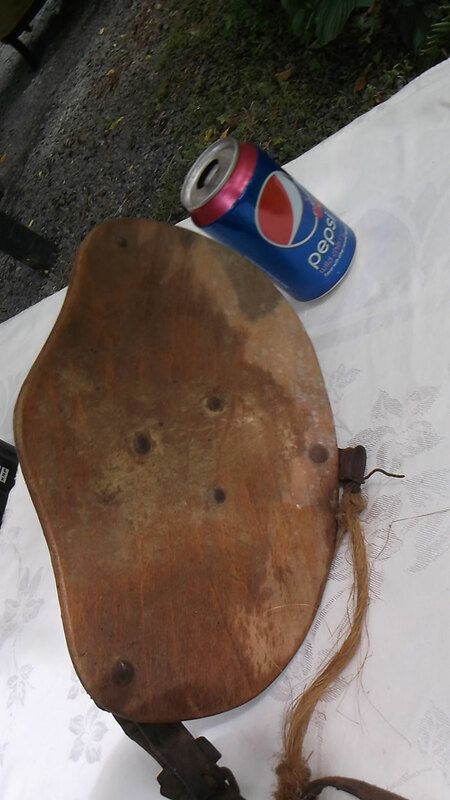 Interesting shape on this early 20th century stool. Leather seat replaces, solid oak, good color and finish. 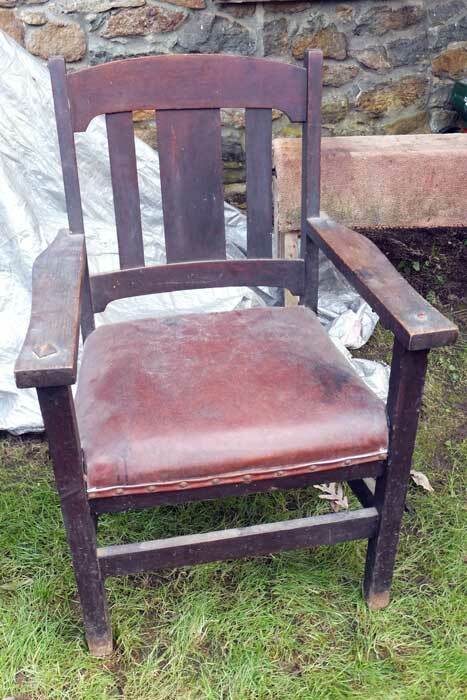 Not a style commonly seen, smaller sized arm chair, solid oak, ladder styled back. 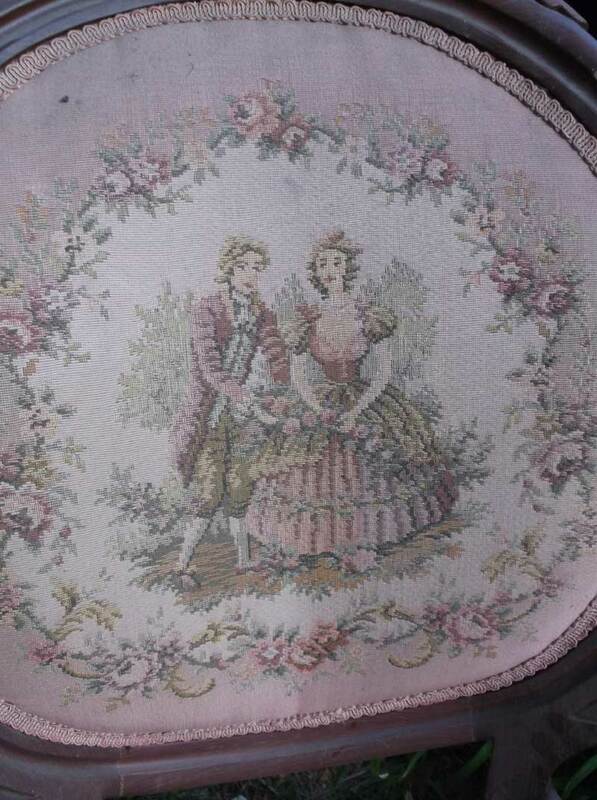 Early empire period, c-1825, needlepoint cushion, good color and finish. Pepsi can for size reference.